More than just showing up. Any musician will tell you there is a lot of work involved in his or her trade. First of all, time and effort in large quantities are needed to before you have mastered the skills you will need. Then you have to turn up for the variety of gigs you are lucky enough to line up. You will also need to teach your instrument in order to make ends meet. These are the facts of any musician’s life. It’s pretty full, especially if that’s how you make your living. Norman Nelson, our esteemed maestro, has done a lot more than that. Admittedly, he is a master musician, though it’s rumoured that he did have to learn, just like any mortal. He has had a long, illustrious career, as you can read in any Sooke Orchestra programme. However, he never paused at what is the usual life path, even for a first-class player. Not Norman. He decided to set up his own orchestra, and did – in Sooke. And it’s a great success. People come from far and wide, begging to play with him. Norman is very good at getting the best from each player, and of course, he’s a tremendous musician. Not only did he set up the orchestra—he added a week-long chamber music workshop, to share his own passion for and expertise in string ensemble playing. Then a concerto competition, to encourage all those hard-working, talented youngsters who would love nothing more than to play with an orchestra. 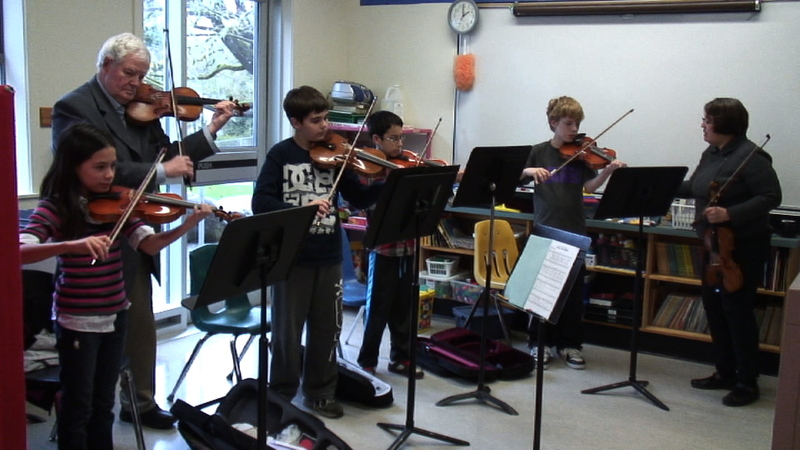 Next, mentoring youngsters at the Sooke middle school, which was lucky enough to attract a music teacher able to get a music programme happening there. All this did not come about solely through Norman’s own efforts. At each step of the way, people joined in to help, whether as volunteers or musicians or teachers, or supporters. But it was Norman and his wife Jenny who always put in the most work and who had the good ideas. On December 1st Randall Garrison will be presenting Norman with the Diamond Jubilee medal. Other Esquimault-Juan de Fuca recipients are people who have served in fire prevention, search and rescue, and social activism. Chief Planes and Elida Peers each got one. Norman is the only artist in the bunch. Did he get it for playing the violin? We don’t think so. It was the incredible work he has done creating this great community of musicians, supported by Sooke, and all the wonderful music that is being enjoyed in Sooke, Metchosin, and Victoria. Congratulations, Norman, from all of us!